« Networks: The Associations of the Future? People talk about Outcome and Process as though they are in opposition to one another. Today, I (again) argue neither works without the other. First, take a moment to reflect on how you approach your every day. Like eating breakfast. We all have low-process default solutions — habits — for outcomes that are part of every day. I eat the same breakfast every day, and I include the ingredients on every shopping list. Habits are a form of very light, often unintetional process. Breakfast requires process — thinking and planning — only when there’s something unusual, like feeding company, or I didn’t make it to the grocery store. Some parts of life always justify intentional process. Resolving a family conflict. Seaching for a job. Finding a new place to live. The same thing is true in our work. Process may be a default habit, or something explicit and intentional. I’ll use examples from my days coordinating Minnesota Green Communities to illustrate how outcome always comes first, and process exists to serve outcomes. A primary initiative goal was to ensure all the homes that received affordable housing subsidy met a doable, robust level of environmental sustainability. As collaborative affordable housing partners, there was ample good will and general agreement that green affordable housing was a good idea. Relying on existing relationships and trust, it was fairly simple to get all the key partners on board. We held joint meetings, discussed a few details (costs! ), and soon funders adopted the Green Communities Criteria as a requirement for new construction buildings. This was our “habit” process. Extending the Criteria to substantial rehabilitation projects was more complicated. Because these project are less predictable, the policy discussion needed more process. With a greater number of meetings and much more discussion we got there. Using our habitual process was again successful. Now, all the housing funded through public and philanthropic partners in Minnesota met the Green Communities Criteria. Then, Minnesota’s affordable housing context changed. Preserving existing affordable housing became a major funding priority, one driven by contracts expiring and financial arrangements rather than major capital needs. That meant a quickly-growing number of projects with limited construction budgets. How we’d adopted our policies meant no environmental sustainability requirements applied to these projects. If we wanted all the subsidized affordable housing to be “green,” we needed a new approach. We (Minnesota Green Communities) did the obvious thing: we repeated our expeditious, low-process approach of the past. Based on existing personal relationships and long-standing partnerships, we advocated for extending the Green Communities Criteria to these projects. This time, it went nowhere. Our partners — for good reason — were resistent. It was too expensive, it was too much to ask of developers, it introduced too much uncertainty into the funding process, it required a complex waiver process, a workable policy was too messy. IThe Minnesota Green Communities team got it. When the main driver of funding is financial structuring, implementing the full Green Communities Criteria is somewhere between a hard sell and nonsensical. We were at a stalemate on how to address environmental sustainability in a BIG portion of subsidized affordable housing in Minnesota. We took a step back with our partners. Our purpose was to require reasonable, minimum expectations for energy and water efficiency and health when providing subsidy for affordable housing. To define those expectations, though, we needed a more intentional process. The first step was to understand our partners’ specific concerns and where we had agreement. We found some simple areas of agreement — water efficiency was a slam dunk. The cancer-causing risks of radon made mitigation obvious. Energy, however, was a different story. Because each project is very different, creating a workable, cost-reasonable policy felt impossible. That listening process was key to identifying what we needed to solve for. We now had our outcome: an energy efficiency policy that was cost-effective for moderate rehab apartment building projects and protected resident health. The Minnesota Green Communities team proposed a task force process to solve the messiest parts of the problem. Highlighting the purpose, we pitched co-convening an eight-month, four-meeting task force to a trusted energy efficiency expert (and past partner) who had worked on multifamily rehab projects and to Minnesota Housing. I offered to handle coordination of the co-convener team and the logistics to make saying, “Yes,” easy. We set clear expectations for what participation would require. Once they said yes, we collaboratively developed an inclusive stakeholder group, and set to work. You don’t need the details of the whole process. It was shaped around the purpose and outcome, with iterative cycles of defining agreement and areas lacking clarity, and then digging into the questions that remained. There were a couple of small work groups, and some technical cost-effectiveness modeling — all aimed at getting to the outcome. What matters is that we did get to our outclme, this (highly technical) policy recommendation from the group. And, the policy was adopted by the funders for moderate rehab projects. That was some serious process! 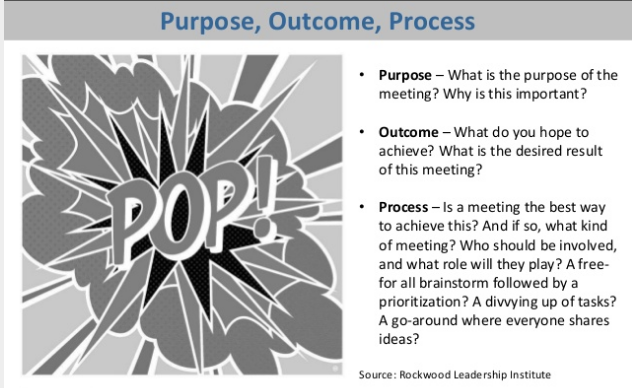 This much process makes sense only when the purpose and the outcome demand it. It makes sense when the question, the challenge is technically or politically or socially complex. It makes sense when there is risk of significant unintended consequences. It makes sense when something can succeed only through widespread ownership of the outcome. I think process gets a bad name when we skip the process because we don’t recognize its value. In our personal lives that might be exercise or sleep or investing time in relationships. In work we often skip people-parts of process, especially when we have a sense of urgency. We’ve all been in meetings, or with friends or family, where we’re running a little late and dive right into the business of the meeting, or making dinner, or the plan. And at some point, things are off — someone isn’t focused, or is distracted, or upset. In forgetting to check in, something more important than the business of the moment got passed over, and that’s interfering with the business of the moment. That initial process of checking in — really checking in — matters to the purpose of getting through the agenda, having a pleasant dinner, or enjoying the plan. Skipping it in honor of productivity and effectiveness, because we think there’s urgency, turns out to undermine the outcome we actually care about. It’s not outcomes versus process. It’s about the right process to achieve our outcomes. Posted on Friday, September 23, 2016 by Janne Flisrand. This entry was posted in Facilitation, Uncategorized. Bookmark the permalink.